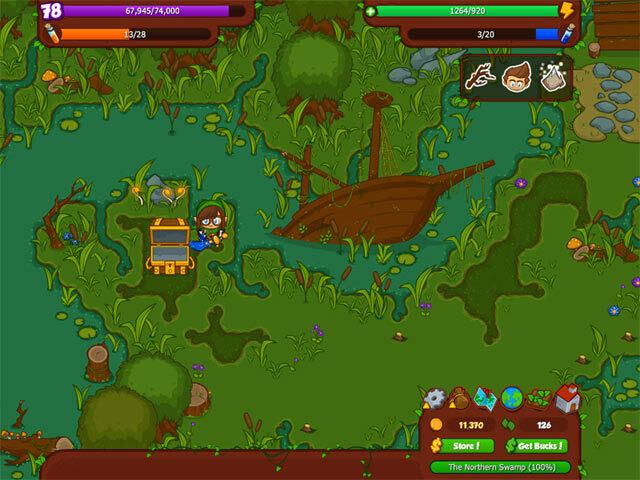 Explore the magical lands of Bush Whacker where anything your heart desires can be obtained by taking a sword to the nearby bushes! 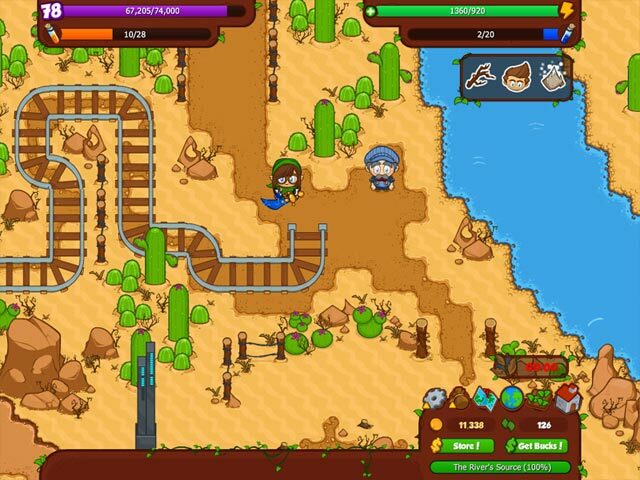 Complete puzzles, find untold treasures, and help the inhabitants solve their ridiculous quests. Customize your character in countless silly hats, capes gloves and glasses! Play this game for free or enhance your experience by purchasing additional gameplay, virtual items, powerups, or other fun extras within the game. 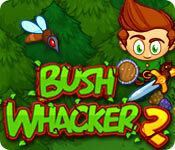 Bush Whacker 2 is rated 4.2 out of 5 by 11. Rated 5 out of 5 by Motsysh from Woot I love this game! And it is nifty. Rated 5 out of 5 by HorseDancer1 from LOVE this game! I played Faunasphere and My Tribe. This has the best elements of those games PLUS reminds me of the old King's Quest series that I totally love and miss. Find items, energy, money and mana so you can continue on. Some items can be combined into better items. Your character can be completely customized (hair, eyes, clothing & accessories) and have many different kinds of animal companions. Some of which help with finding different items. There are many quests and characters to help along the way. And a village commons to build!!! Your Energy is important, and it recharges overnight. So unless you actually spend lots of money, you can't play all day like you might want to. The only thing I would wish for is weekly specials instead of monthly specials and that they would cost a bit less. If you could buy them for $5 or $10 per week, I would likely buy more! Love bargains! Great graphics and a fun storyline. It is a bit addicting though! ;) You can chat and interact with other players. This game can be played totally free, too. It will just take you longer to get things done. Rated 5 out of 5 by LikaLaruku from Sweet retro parody of oldschool RPGs. If your first question is "is there any difference between playing this on Bigfish Online? Answer is no; it basically just makes a large window pop up that runs your current gamesave. Does it work offline? Nah, it saves to a server, but an offline version would be a great idea for Bush Wh@cker 3, that & getting rid of the whole energy thing. 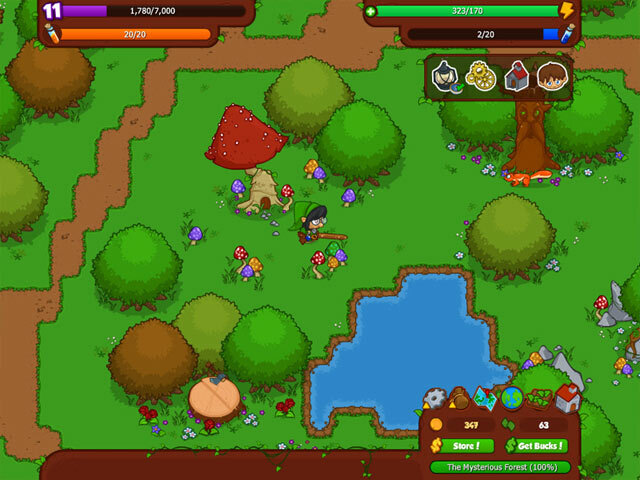 If you've never played it on the site before, this game is an homage to stuff like The Legend of Zelda, Pokemon, Adventure Time: Hey Ice King, Why'd You Steal Our Garbage, etc. If you're not familiar with oldschool Nintendo games, I can tell you it's a bit like the Aveyond & Millennium series. It's an improvement over the first game, which is still good & only available on Facebook. Hopefully Bigfish will bring Bush Wh@cker 1 to Bigfish Online & eventually let us use club credits to buy bush bucks. If you're wondering why I'm spelling it with an @, it's because Bigfish's language filters consider the title to be "obscene language." Rated 4 out of 5 by tainkyisin from Wonderful for me It is a wonderful for me and It is a interested thing for me. Rated 4 out of 5 by canadiangirl94 from Easy concept, but quests take a while Light and easy game if you only have a few minutes to spare. However there is nothing really to it. Just whack bushes and hope that either puzzle pieces or quest items come out. The only challenge are the puzzles but they are ridiculously easy. No story whatsoever so if you're looking for something with a purpose, avoid this game. But if you want something really quick and simple, then this one fits the bill. Rated 4 out of 5 by SoulsRival from Would Have Rated 5 BUT Energy levels not permit much game play Awesome Game Totally addicted!! Easy to pick up. the chat box is very helpful. Quests, Treasure Hunts , Building Fishing, Pets Endless Adventure IF The Energy wasn't Disappointing !! Energy is quick to use & 24 hrs. to refill Although fishing helps gain some energy there isn't Enough things that you obtain enough to proceed through levels unless you want to max your credit card out. This is frustrating and Kills the excitement of new quests and Areas Especially when 1 Puzzle piece is needed to finish an area and depleted Energy sources spoil the excitement You start to lose interest in playing Shame cause its a truly Amazing Game. Rated 3 out of 5 by vlhvlhvlh from Great, if you like to play it for only 15 min/day This would be a great game but with limited energy, you can play about 15 minutes & all your energy is gone.